AWS Integration now supports DynamoDB etc. This week, a new feature has been added for AWS integration. The long-awaited DynamoDB is now supported. Now on to the latest update information. Refer to the help page below for more on obtainable metrics. This feature was co-developed together with iret Inc., a development firm with abundant AWS operational knowledge. iret Inc. offers the cloudpack service, which provides fully managed services for a variety of AWS products. iret, thank you for all your help! 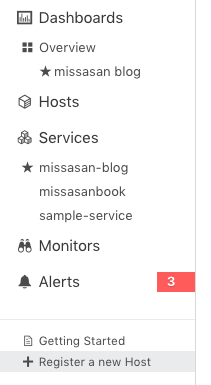 In addition to email and Slack notifications, it is now possible to register Webhook notification channels using the API. For more details, check out the notification channel API document below. In the “Register a new Host” screen that can be accessed from the left sidebar menu, an API key clipboard was added to the GUI installation procedure for Windows servers. You can copy the API key from the same screen as seen below. If you have any ideas or points of improvement regarding how to install mackerel-agent on Windows servers, we would gladly welcome your feedback.